In this edition of the SA parkrun newsletter, we visit Jo’burg and Cape Town parkruns on Freedom Day! 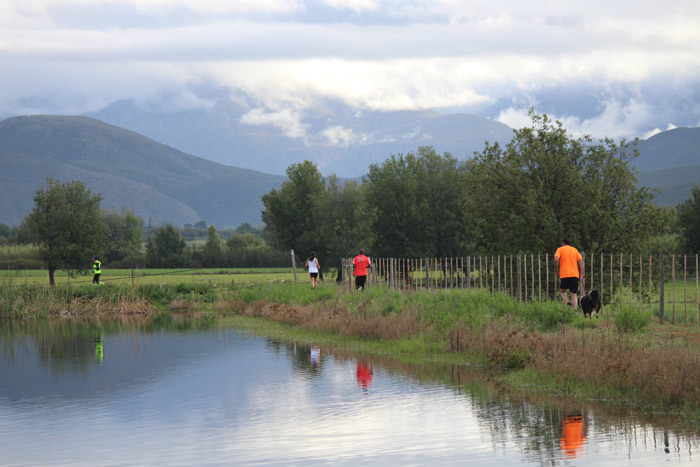 The beautiful Oudtshoorn parkrun launches in the Karoo. Don’t miss the Modern Athlete digi-mag and the wonderful feedback from our runners at parkruns throughout the country! We would like to welcome Oudtshoorn parkrun to the parkrun family. Kim Vermeulen and her team have created a really beautiful parkrun to rival the others along the Garden Route/Karoo. 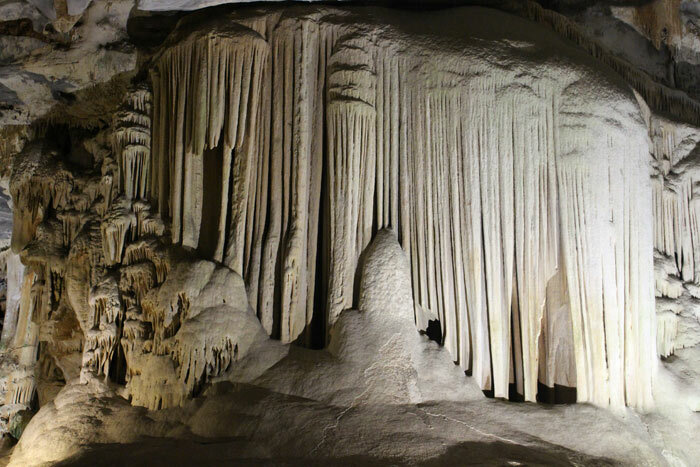 This parkrun has already been enthusiastically embraced by the local community and with its close proximity to ostrich and olive farms, beautiful mountain passes and the Cango Caves will attract many visiting parkrunners. Well done Kim, and thank you to Surval Olive estate for their wonderful contribution. For the first time parkrun SA celebrated Freedom Day with a series of freedom runs in Cape Town and Johannesburg. Trevor Doyle in Cape Town and Staci Katsivalis in Johannesburg initiated and organised, with their communities, the concept of enthusiastic parkrunners running six different freedom parkruns in Cape Town and nine in Johannesburg. By all accounts the idea was well received and was a great success. 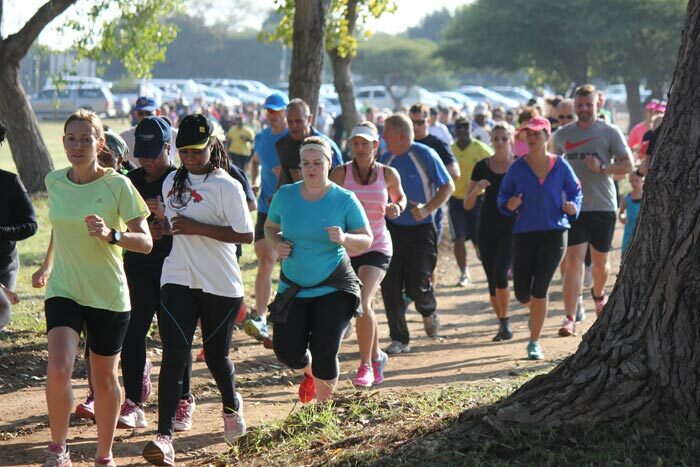 Modderfontein Reserve parkrun is celebrating ‘World Move for Health day’ on 9th May as they did last year. 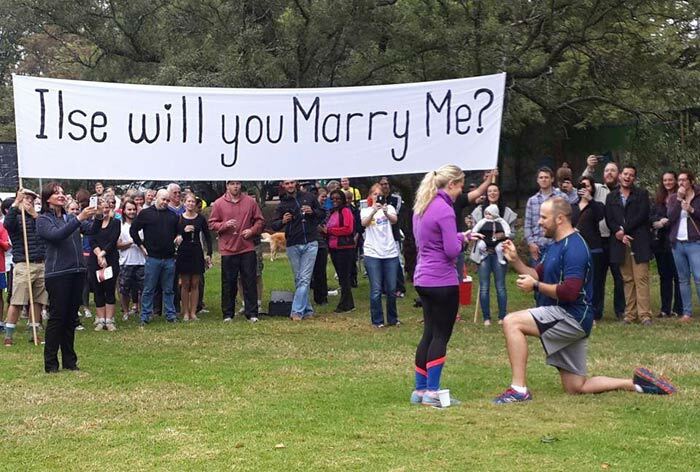 They are encouraging Gauteng based parkrunners to attend this special day. All the national parkrun sponsors will be present. There will be some spot prizes. Please arrive early to avoid parking problems. See you on 9th May at Modderfontein Reserve! Wonderful things happen at parkrun and they are not always about running. This marriage proposal happened at Delta! The 9 Freedom Runs for Freedom Day started in the dark at Ebotse and finished just as the sun started setting at Modderfontein. 45km on foot, 150km in the car and twelve hours from start to finish. 21 parkrunners completed all 9 parkruns with as many as 50 taking part at the individual venues. The Freedom Run initiative was so well received that it might become an annual event so watch this space. 6 Freedom Runs for Freedom Day is how a group of parkrunners from Greater Cape Town area spent their Freedom Day on Monday! When the infamous Trevor Doyle and Colin Doyle, from Root 44, saw what was being planned in Gauteng, they didn’t want to be left out! After some discussion with Torrin, to check exactly what a freedom run entailed, it was left to David Papenfus to organise the logistics. What a fantastic job he did! The morning started with a chilly run in Fish Hoek. Luckily there were a couple of locals to lead the way or a few parkrunners might still be running around the peninsula! Then, now all awake, it was on to Rondebosch Common. After two quick laps, lots of laughs and photos we headed off to Greenpoint. Quite a few new faces joined in. Now 3 runs in, the legs were starting to tire, but everyone was still smiling. On to number 4, Big Bay. The beach run also meant lunch! But by number 5, Bellville, maybe lunch wasn’t such a good idea! At Bellville the thought of ‘ just one more’ by those who had started at Fish Hoek kept them going. The last route of the day was the organisers home run. Number 6, Root 44 and her hill. They arrived with moans and groans as they looked up at the vineyard. A young family also joined in, with our youngest freedom runner being only 5 years old. Some ran, some hobbled, but they all made it to the finish. At the pub across the road, smelly and noisy, we were ushered to a back table. People wanted to know where we came from. Everyone was very proud to say that they are parkrunners and explained what parkrun is what they just did! Everyone who participated in 1, 2 or all 6 had great fun. We all got to meet parkrunners from other parkruns and realise that we are one big family! 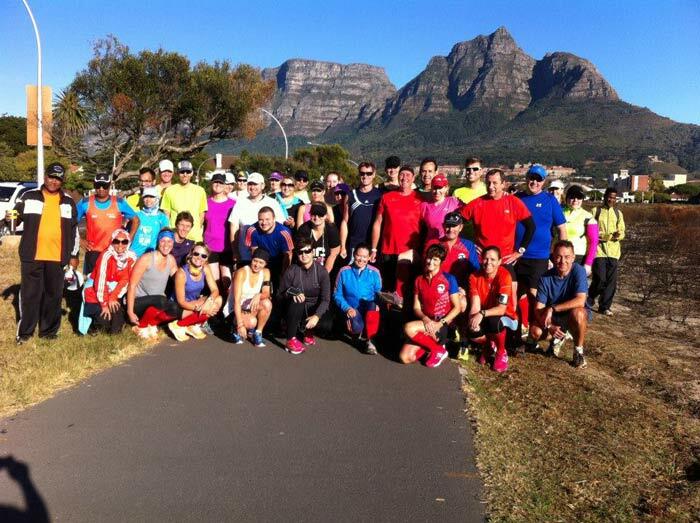 In the end 15 parkrunners completed all 6 parkrun routes in Greater Cape Town area. 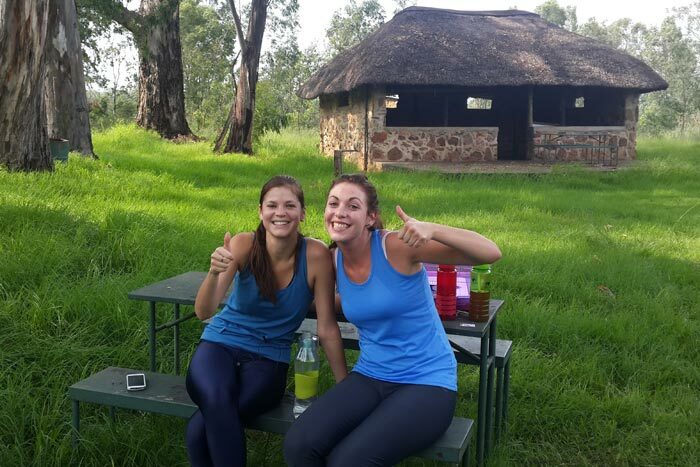 They are already wanting to plan 2016’s Freedom Day and how to fit in a possible 10 parkruns! This was our first year organising this event. We are hoping to see more of you join us next year. The April edition of our Media Partner, Modern Athlete Magazine is available online now! Subscribe to Modern Athlete here. Get active in style with up to 25% cash back on thousands of HealthyGear items at selected sports stores. Activate today and complete an Online Vitality Fitness Assessment to earn up to 15% cash back and a Vitality Fitness Assessment at a biokineticist to increase your cash back to up to 25%, on a range of fitness devices, sports gear and equipment. Not a Vitality member? Visit Discovery or SMS “Sport” or “Gear” to 48030 to join. Do you remember our 1st birthday party? After you all have finished parkrun, we will have prizes and cake! Who are the leaders on the annual points tables for the ladies and the men, the oldest age group record holders, the under 12's? Will the Doyles’ hold onto the family title? Adidas will be there with a lucky draw for a brand new pair spiffy shoes! Juniva ​will also have a surprise for you! Adventure Bootcamp, Somerset West is sponsoring a camp for one lucky lady! As parkrun is part of the community we try to give back as often as we can. Last year we did a toy drive to help out a needy pre-school and donated all the collected toys to Gaceland in Devon Valley, Stellenbosch. This year we have decided to do a drive for our 4-legged parkrunners less fortunate furry friends. A list of what is needed will be posted on our Facebook page this week. Root 44 parkrun 2ND Birthday party! My sole objective in sharing my story is the hope that it may encourage others to take up parkrun. In November 2013 at the age of 57 I was unfit, my metabolic rate had slowed to a crawl so I was overweight and in fact I was on the verge of being clinically obese. That was not a nice situation to be in, especially since I’ve always eaten healthily and there was very little that I could cut out of my diet. It was the classic case of desperate times calling for desperate measures! But what could I do? I’d pushed weights in the gym for many years, but didn’t fancy going back to that. I’d also done a fair amount of road cycling & mountain biking in the past, but I’m put right off taking cycling up again because of the high costs involved. I live just 5 km away from Delta Park, one of my favourite places in Johannesburg. I decided to start walking and jogging there since it is convenient and inexpensive. At first I could jog no more than sixty metres at a time! Inwardly I felt ashamed that I’d let myself get so overweight and unfit; products of a sedentary, office bound, lifestyle. I was out in the park early one Saturday morning and saw runners and walkers going around. Then I noticed the banners next to the Environmental Centre and asked one of the organisers about the event taking place. It was the first time that I’d heard the word ‘parkrun’. I went home and Googled. The next day I set off from the parkrun start in Delta Park at 8am and walked & jogged the course in about 55 minutes. From the Delta parkrun website I saw that that time would put me about 90% down the field. That was good enough for me because I knew I wouldn’t finish last! I enrolled, got my barcode and did my first parkrun the next Saturday. Over the next few Saturdays I waddled my way round the taxing Delta parkrun course and got a few pb’s as my performance slowly improved, but I soon found out that all improvements at my age are only incremental at best. Then I suffered from a succession of lower leg cramps. I mentioned this to a friend, a keen lady cyclist who gave me good advice, and I Googled some more. Eventually I discovered I had a magnesium deficiency which I’ve cured by taking just two Slow-Mag pills a week. That did the trick and I’ve not suffered cramp since. In the 17 months it’s taken I’ve lost 8kg. The running started off as a means to an end, but I’ve come to enjoy it and I do training circuits of the park once or twice during the week. I have more stamina in my daily life, I readily feel the improved fitness, I can walk at normal pace uphill without having to breathe through my mouth and I can feel a myriad of smaller benefits too. The message is clear; if I can do parkrun and enjoy so many benefits from it as a result, there being nothing remarkable about my story, then just about anyone can. · Get a pair of good trail running shoes. Apart from the good traction, support & cushioning that they provide they have a toe protector strip which protects your toe joints against compression if you kick an exposed tree root. · Always hold a little in reserve all the way around the course; if you are overweight and perhaps a bit out of shape you are simply nowhere near fit enough to go into severe oxygen debt and this must be avoided at all times! Always ‘leave a little in the tank’ on your way round the course, relax and enjoy. Good luck- stick at it and you will make meaningful progress over time! I extend my enduring thanks to parkrun SA, to Bruce, to the sponsors; adidas, Blue Label Telecoms & Discovery Vitality and especially to our wonderful Volunteers who together give us parkrun in South Africa. I am writing to you a couple of days before my wife Rose Rawstron,s 50th parkrun to honour her as my role model. She encouraged me for many years to walk/run for excercise for which I was not interested for various reasons. However in November 2013, I started walking the Hobie beach parkrun. In January 2014 (at the age of 58) I began to jog and have subsequently become a keen runner and especially a parkrunner, having completed 62 myself. I now run up to 25kms a week, have joined a club, and hardly miss a parkrun. Along with my gratitude to my wife, I want to thank you all for your incredible enthusiasm and support for what I think is the friendliest and best run venue in which I have participated, and am delighted to encourage all I know to come and try-out. Just want to say many thanks to all the event organizers and especially the volunteers who come out every Saturday what ever the weather. The parkrun was just the thing…. May PARKRUN go from strength to strength . It would seem that the parkrun wave is gathering momentum and soon there will be a parkrun in most of the towns. As this happens it is more and more difficult to track the the growth and happenings. Is there any possibility that a 100 club page could be created to list all the 100 club members in SA? As I approach my second fifty runs at a parkrun (63 at Nahoon and 49 as Sunrise) I was wondering if there are other parkrunners (in SA or worldwide) that have achieved the double (or triple) other than Henry Pienaar at Kidds Beach? Drop us an email if you have an interesting parkrun related fact, happening or comment that you would like to share with all parkrunners. Printed barcodes are used at all our events to record your result. Please click here to collect and print your barcode. No printed barcode, No result. We have teamed up with TenBits to provide a barcoded wrist-band (see the image above). This wrist-band includes your parkrun barcode and emergency contact details. In addition, a portion of the proceeds contribute towards parkrun costs. For more info and orders please visit the TenBits site. We ask every parkrunner to volunteer 3 times a year. When volunteering you receive the maximum number of points towards the yearly competition. All children under 11 must be accompanied by a parent or guardian at all times. Guardians must ensure that children place themselves appropriately so as to prevent a situation where they are being repeatedly overtaken at the start. This is to ensure the safety of your child. Download & listen to the latest South African parkrun show now on iTunes. Brought to you by I Love Running. Discovery Vitality believes that every decision that a person makes to exercise and get active is a step in the right direction, and participating in a parkrun is no exception. Living a healthy lifestyle can be rewarding, and Discovery Vitality members 18 years and older can earn 500 points for participating in a parkrun event. Children six years and older who are dependents on their parents' Discovery Vitality membership can now also earn points for completing a parkrun. Visit the Discovery website for more information. 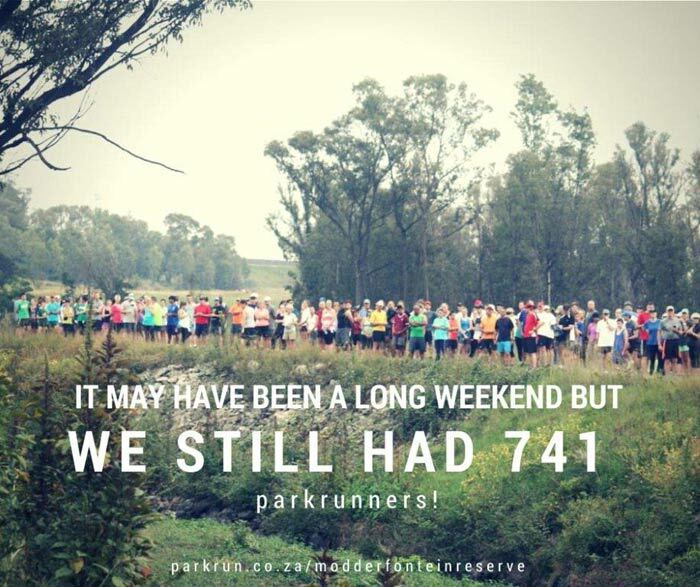 In this edition of the SA parkrun newsletter, were you caught by the April fool prank in the last newsletter? Take part in the 9 Freedom Runs on Freedom Day. Polokwane celebrates their first parkrun! Middleburg parkrun director podiums at the Two Oceans trail run. We hear about Polokwane’s first parkrun as well as news from Mashishing and Parys parkrun. It was Auntie Maureen who suggested that Polokwane needed a parkrun. “How can I be the Aunt of Bruce and Gill Fordyce and not be able to boast of a parkrun in my town”, she argued. Battling cancer, Maureen Le Cordeur wanted to leave something of a legacy behind and parkrun seemed the perfect gift. She put parkrun in touch with Felicity Roberts, who formed a team with Kirsty Tucker and Irene Schempers and a few months later Polokwane parkrun was launched in the Tom Naude Park. Polokwane parkrun was given wonderful support by City Parks. 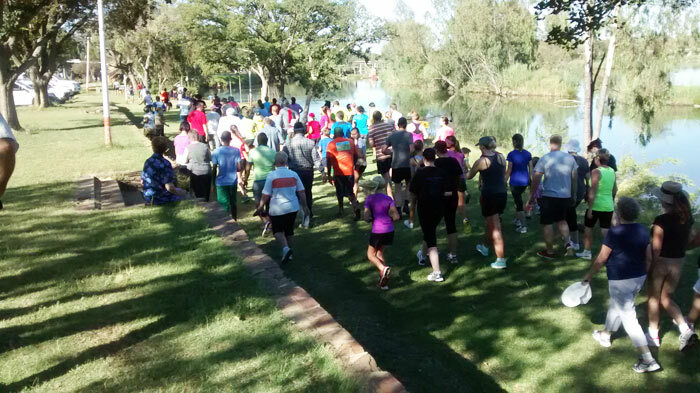 The parkrun tourists who attended the inaugural run last Saturday were amazed to see that two concrete bridges had been built especially for the runners and that the lake had been cleaned and litter and refuse removed. On a beautiful autumn morning more than 200 excited parkrunners arrived to start what will surely be a very successful parkrun. Sadly aunt Maureen passed away before the parkrun was launched but Uncle John (age category 75-80) completed his first parkrun and appears determined to do many more. Thank you Maureen and John Le Cordeur for your wonderful contribution. This Saturday we welcome Oudtshoorn parkrun to the parkrun family. A number of parkrun tourists have decided to travel to Kim Vermeulen’s and Louis Engels’s exciting parkrun in the Surval olive estate. The famous Cango Caves are worth visiting and there of course there may be the odd interested ostrich spectator! Up for the challenge? Monday 27 April: 9 Freedom runs for Freedom Day. Just for fun, just because we can! The schedule can be downloaded here. The schedule allows for a 50 minute parkrun, travel time and just enough time to have a snack or toilet break in between. Celebratory drinks at a venue nearby to be confirmed. Bouquet for Polokwane Municipality Parks and Garden Department. Hats off to the Polokwane Municipality Parks and Garden Department for their assistance and co-operation in preparing the course for our Polokwane parkrun, which was launched Saturday 11th at the park across from Tom Naude School. We could not have done it without you, and Polokwane would still be waiting to join the national and international parkrun family. They built little ‘bridges’, graded paths, cleared and cleaned the park so that our first run was in a clean and neat park, which many commented on. “What a beautiful course” - trees, water and grass - we had it all! We (the parkrun team) hope and pray that parkrun will bring new life to the park and its environs. Thank you Councillor Lois Hardy, Maxwell Ledwaba, David Morapi, Happy Shikwambana and all the workers who made our dream come true. Come down to your local parkrun this Saturday and receive expert advice from an adidas brand coach on technical running footwear. They will be offering runners an opportunity to test adidas running shoes with boost technology for free and provide personalised fittings, allowing you to get the best solution for your unique running style. The brand coaches will be found at selected parkruns nationwide – Cape Town, Johannesburg, Pretoria and Durban. Stand a chance of winning FREE Neon Run tickets! Join and you will be put into a draw to win a FREE Neon Run ticket. The Neon Run events are taking place around South Africa and involve running, walking, cycling, or skating a 5km route and are a great way to combine fun and fitness for the whole family: wearing bright, fluorescent clothing, neon paint, and glow-in-the-dark accessories. 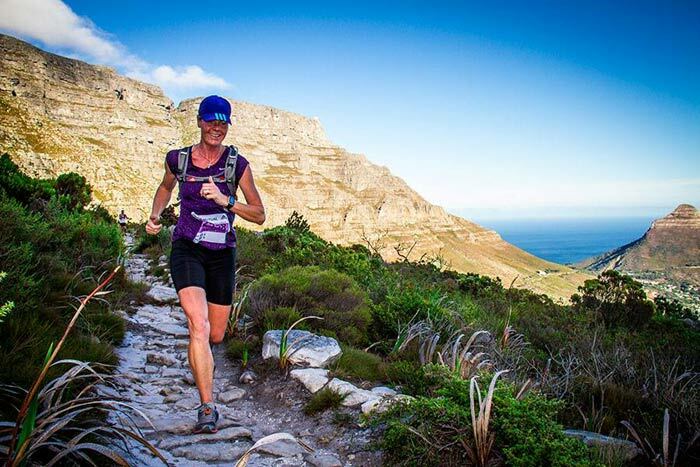 Middelburg parkrun event director Lerentia Strydom came third in the 2015 Two Oceans Trail Run (23km) - a tough route that take runners through forest rails, jeeptrack, some tricky scrambles and single track up and down Devil's peak mountain. Winning the bronze medal was a remarkable achievement, especially considering that Lerentia ran her first trail run less than a year ago and was the only one on the podium that is not a professional trail runner. 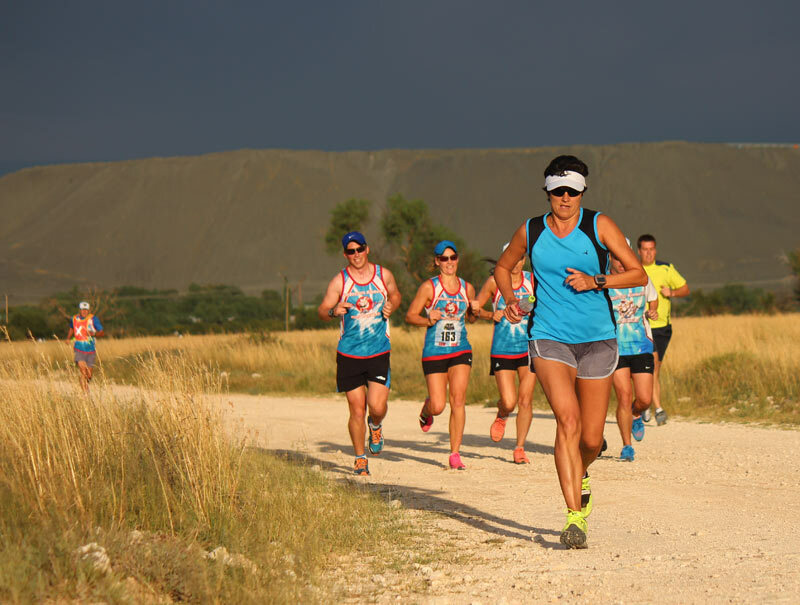 With all that she has learned the past few months and wins in other trail runs including the popular Gauteng Spur series against top competition, she is looking to keep on improving and return an even better runner next year. Mashishing parkrun is located in the Fisheries with beautiful gardens, dams and the sound of water running through the canals. You would also find some cattle on the route and if you’re lucky you'll see the Blesbok up close. Our parkrun is small, but I know everyone by name and you can be sure that you will get special attention if you visit us. We have young and old, singles and families that have picnics in the garden after parkrun. The route starts at the "Boshuis" lapa in the Fisheries where there are beautiful trees and the sound of birds chirping, running on a dirt road up past the gardens and around the fish dams and back down to the lapa for a second round. We like to encourage the runners as they pass for their second round and keep them motivated to do their best. We hope to see you soon at our beautiful parkrun in Mashishing. The second parkrun in Free State was Parys parkrun. This was launched on 8th November, on the 3rd anniversary of parkrun in SA and was the 43rd in South Africa. It has a stunning course along the banks of the Vaal River. All visitors compliment us. We have regular visitors from the surrounding areas including Johannesburg, Potchefstroom and Klerksdorp. We have had visitors from as far away as Durban and Amanzitoti. It is small but it is still growing averaging some 80 runners every week. Come and enjoy the friendly atmosphere at the start and finish where you can relax by the river. Parys is a lovely place to spend a relaxing and enjoyable day. The parkrunners often pass groups setting off on white water rafting trips. You can enjoy a variety of sports including mountain biking, abseiling, skydiving and ballooning. Alternatively, you can browse the many arts and crafts shops on the main street or sit and enjoy a coffee or meal at one of the many restaurants and cafes. On the first Saturday of the month, parkrunners run past the riverside market Hartelus Mark, being set up at Egweni. After parkrun, visitors can browse the interesting food, drink and arts and crafts stalls there whilst listening to the band and enjoying the beautiful riverside location. It has the oldest couple worldwide to complete a parkrun. Coenraad, 91, and Lelia de Jager, 87, are regulars at Parys parkrun. Coenraad and Lelia really embody the principle of parkrun as available to all. They are a lesson to us all about how to keep fit in our old age. It is twinned with Skipton parkrun in the UK. This is the ‘home’ parkrun of the two people who set up Parys parkrun, Peter Watson and Judy Brown, a British couple who have a holiday home in Parys. Skipton parkrun kindly donated a suitcase of second hand running shoes for disadvantaged runners. Peter and Judy have now returned to the UK for 6 months. Parys parkrun is in the hands of a team of 5 Run Directors, Karen Addison, Iris Andrew, Gerrie Bester, Renee de Jong Hartslief and Lorette Pretorius who will each organise it on a rota basis. The team is ably assisted by Saal de Jager who runs the local security firm and stores the equipment. Lungile Kulashe also helps every week. The team works hard to ensure parkrun is inclusive and that many runners from disadvantaged areas take part. Come and join us one Saturday! Last Saturday the 11th April, my husband Rob Lanning achieved his 50th parkrun. He is 75 years old and was the first Great Grand Master to achieve this milestone a the Root 44 parkrun. He has been running since 1984 and has completed 18 Comrades, 2 Washies.....no London to Brighton...not in the cut off time to qualify. He has done 20 x 2 Oceans and 20 of most of the Cape Marathons ie: Winelands, Voet of Africa, Peninsula and Riebeek Wes. In 2006 he had a triple bypass but that has not deterred him but has reduced his distances . He found the parkruns and is now hooked. Every Saturday he is at Root 44 and when we go on holiday the first thing we want to know is where are the parkruns?! We went to UK last year and did the Bushy Run a week before the big day but we enjoyed it immensely. On Saturday our daughter and family from UK were with us. Our son, grandson (from Pinelands) were with us to celebrate. Torrin and her team were wonderful in acknowledging his achievement and allowing us as a family to cross the line together… see the pictures on facebook. I can only thank the volunteers for making this such a special day for Rob. My family from UK said Root 44 was such an awesome venue and to see so many walkers, prams and dogs only lead to the friendliness of the event. Being able to socialise at a craft market was great. This is our home parkrun and we just love the friendliness of organisers give. Cheers and thanks for a wonderful organisation! I am writing to you a couple of days before my wife Rose Rawstron’s 50th parkrun, to honour her as my role model. She encouraged me for many years to walk/run for exercise for which I was not interested for various reasons. However in November 2013, I started walking the Hobie Beach parkrun. In January 2014 (at the age of 58) I began to jog and have subsequently become a keen runner and especially a parkrunner, having completed 62 myself. I now run up to 25kms a week, have joined a club, and hardly miss a parkrun. Along with my gratitude to my wife, I want to thank you all for your incredible enthusiasm and support for what I think is the friendliest and best run venue in which I have participated, and am delighted to encourage all I know to come and try-out. I thought to send this to you to possibly have it in the next newsletter. I was in Stutterheim for work on Friday 10 April 2015 and thought to try do a freedom run at Stutterheim parkrun. I got in touch with Event Director, Linda Lanz as I was not firmiliar with the course. I want to thank, Linda and Stutterheim parkrun volunteer, Eric Wylde for all your time and effort you put in just so that this PE boy could do a freedom run on your course. I especially want to thank Eric for not only coming to meet me at the country club and explaining the route, but then also being my very own marshal. Thank you so much. On top of that, tired legs and all, I really enjoyed running your parkrun route. 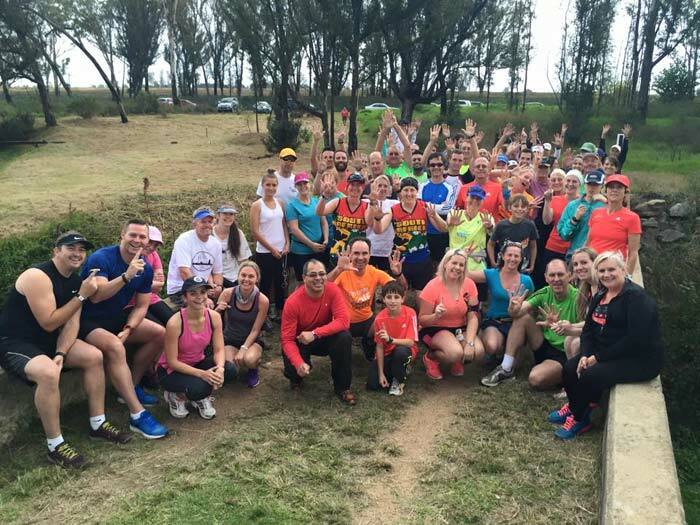 In this edition of the SA parkrun newsletter, we hear from the new Kimberly parkrun. North Beach parkrunner achieves his 50 in a wheelchair! Find out how you can link your parkrun profile to Strava. We are pleased to announce that all parkrun routes will be lengthened – the new plans are being rolled out this month. This has been an exciting time for parkrun SA as at last Kimberley parkrun joined the family. 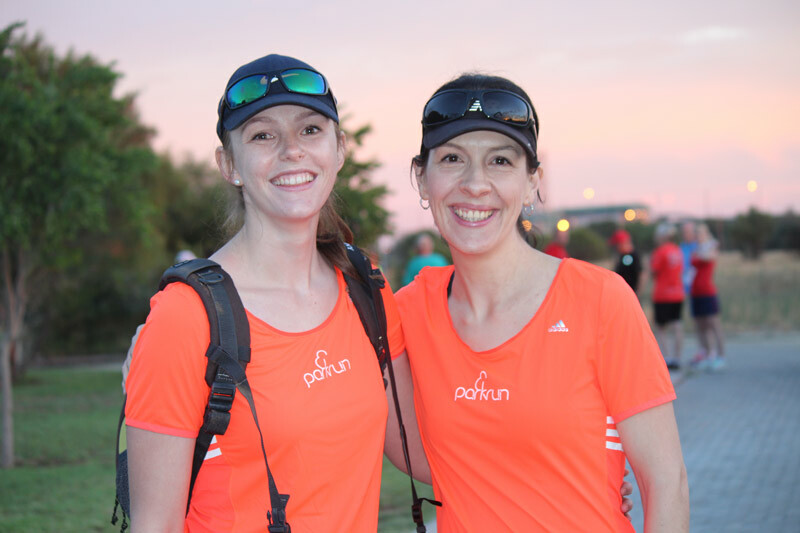 Karien Potgieter used to run at Naval Hill, Bloemfontein but when she moved to Kimberley she missed her parkrunning so much she decided to start one in Kimberley with the help of her friend, Corne Pretorius. 6 months later Kimberley parkrun was launched with 157 first timers In the Rooifontein nature reserve. The local running clubs showed their support and a number of parkrun tourists were also present. All agreed that any parkrun that could offer a fast flat course with Springbuck, Zebra and Secretary Birds as spectators would have to be a success. 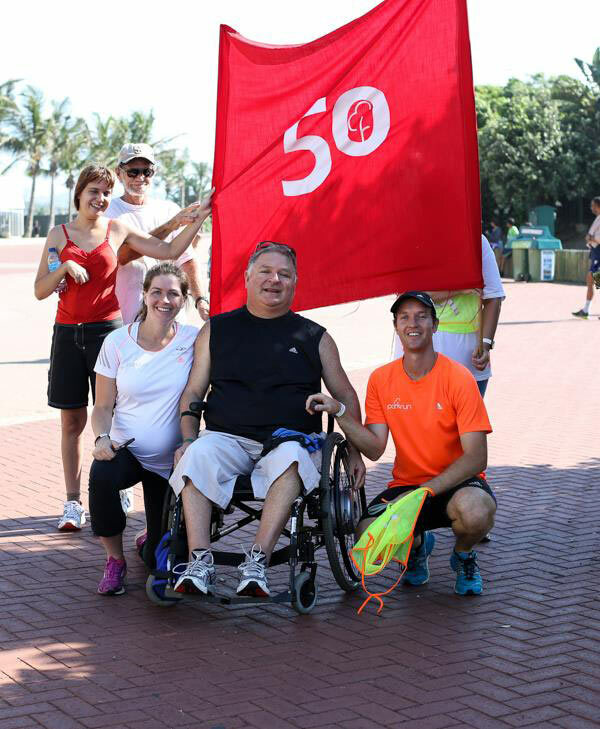 We are particularly proud of Ari Seirlis who has earned his 50 club red shirt by completing every one of his 50 runs in his wheelchair. Ari who is CEO of the QuadPara organisation in SA was strolling past Durban’s North Beach parkrun a few months ago when he spotted the North Beach parkrunners running past. He immediately joined in and has been a regular ever since. Obviously Ari has to sit in his chair when he participates and therefore his “50” number would be obscured by the back of his chair. parkrun decided to present Ari with a red shirt with the 50 emblazoned on the front so that he can proudly show-off his achievement. Dieter Meyer astonished everyone with his run at Lebone parkrun in Rustenburg last Saturday. He was first finisher for the first time in his 167 parkruns. 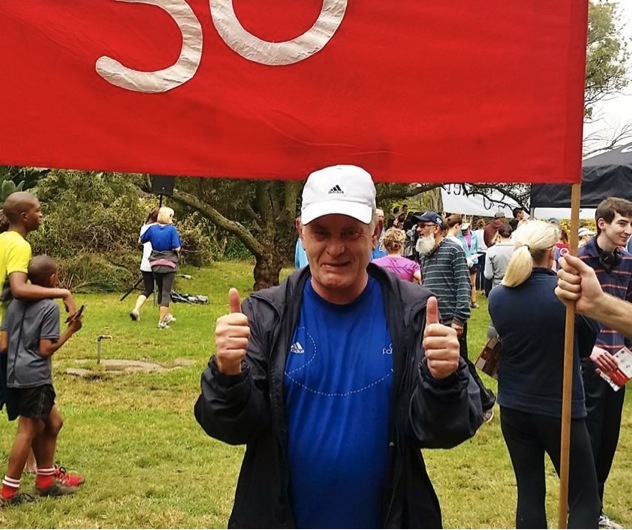 Affectionately known as Delta Dieter or Modderfontein Meyer for his two most frequented parkruns Dieter’s achievement is remarkable because he runs in the 65-69 age group category. It is gratifying to see that some of our rural parkruns are doing so well. 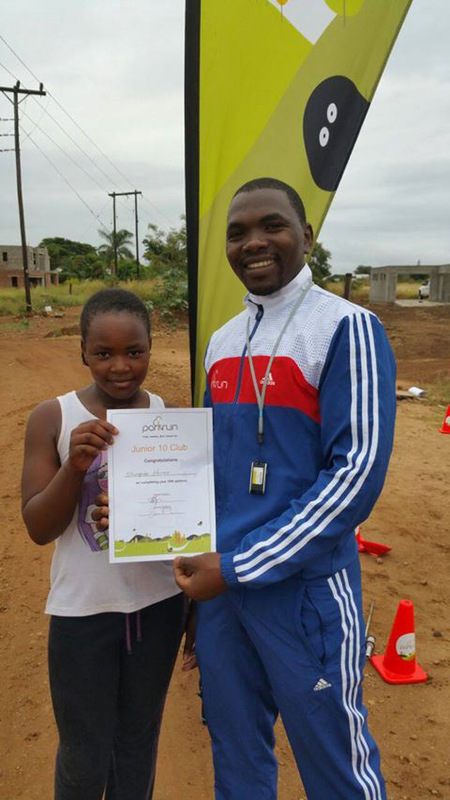 Cannibals Cave is growing from strength to strength under the guidance of Lizzy and Muzi Mabaso and at Nkomazi Lordrick Mathonsi has started to hand out his first parkrun certificates to juniors. Some parkrunners will react negatively to the news that South African parkruns have been extended in length to 6 kilometres. Others will see this as compliment and a tribute to our running strength. At a recent conference it was noted that the standard of parkrun times in South Africa has improved so rapidly that the 5km. is no longer a challenge for our parkrunners. We would like to ask all event directors to start measuring an extra kilometre on their parkrun routes so we can implement this change as soon as possible in April. Finally we would like to wish all parkrunners running the Two Oceans this weekend the best of luck and don’t forget the 56 kilometre race passes just a couple of blocks away from the start of Fish Hoek parkrun!! You should receive lots of encouragement from passionate Fish Hoek parkrunners. Strava is delighted to have partnered with parkrun, here we will describe how you can link your profiles and outline what’s in it for you and the rest of the worldwide parkrun community. To serve runners is the common bond that makes Strava and parkrun click. It’s a partnership with shared objectives at its core; to serve, entertain and motivate athletes. Both parties are trying to do the same things, so by partnering up we can serve a portion of our shared communities even better. Through this partnership parkrunners will now be able to easily find and connect with each other on the Strava platform, as well as track their own performance and measure improvement. 1. Be a member: First of all you need to be a parkun and a Strava member. If you’re not already a parkrun member it’s easy to become one and you’re probably not far from a run, have a look here and select your country for details. 2. Go to your parkrun profile page: If you don’t have it bookmarked already, you can get a link to your parkrun profile page by clicking here. 3. Click ‘Link To Your Strava Profile’: On your parkrun profile page you’ll see an option (at the bottom of the list) to ‘Connect with STRAVA’, click this. Congratulations to Robert Boulle who has won a trip for two to Australia courtesy of . He will be jetting off on Qantas in a brand new adidas kit to the value of R5 000, in August 2015. He will also have the opportunity to participate in the City2Surf Marathon in Sydney and earn Vitality points. You can still join the Team Vitality movement and get up to 25% or 50% cash back on registration entry fees for selected events, a premium Team Vitality starter pack with race gear and vouchers worth over R1 000 for selected fitness devices. You’ll also earn Vitality fitness points for completing selected races on the Team Vitality race calendar. *** reverse the spelling of Lirpa Loof and you get……..?